The two biggest open world games of the year find themselves clashing across ancient battle lines. Nintendo fans have The Legend of Zelda: Breath of the Wild, Sony fans have Horizon Zero Dawn, and I have my bucket of popcorn while I sit back and watch what looks like a rerun of 1998 when Final Fantasy VII and Ocarina of Time were the chief foes of the gaming world. Both games have dominated on the critics' front, but now game developers are starting to chip in, one of whom works for Nintendo itself. Masahiro Sakurai, the creator of Kirby and Super Smash Bros., has had his say on both games in a recent interview with Famitsu, translated by Source Gaming. He doesn't say which one he likes better, but he does suggest that both are masterpieces. A week before writing this column, two wonderfully outstanding works were released and I was torn between how to spend my time. 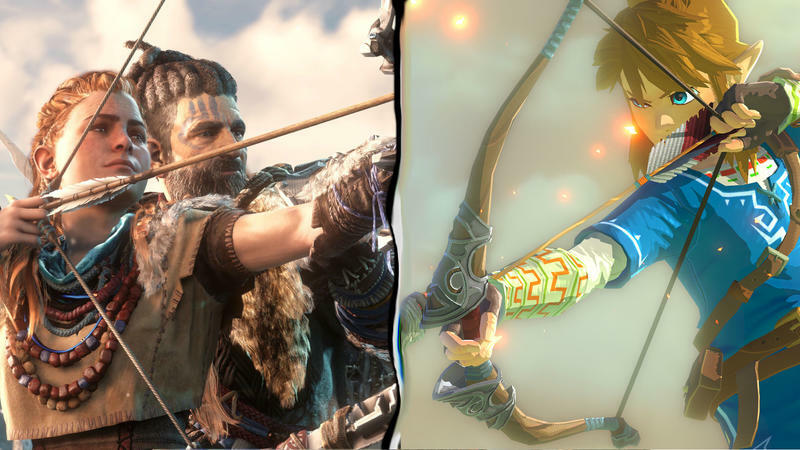 Horizon Zero Dawn (from here on out "Horizon") and The Legend of Zelda: Breath of the Wild (further referred to as "Zelda"). By all means, play them both because they really are masterpieces. With that being said, I am surprised by the fact that although there are aspects that are very close, there are other aspects that are very different. He then summarizes the similarities in the games and the differences, His list is quite long, meaning he is one astute guy. Antiquated culture. There aren't many towns. A story that chases a forgotten past. Strategy and tactics centered around the bow and arrow. Day to day collecting of raw materials and hunting. Hiding and surprise attacks are effective. Enemies drop their equipment when neutralized. Use everything of the surroundings. Catch wild creatures and ride them. Skillfully prepare and change equipment to best suit the situation. The last boss puts the enemies of nature under its control by an invisible power. Development period was roughly 6 years? Next, I will summarize the areas I felt were contrasting. The former is Horizon, and the latter is Zelda. New IP from overseas. / Series with a deep history in Japan. Enemies are mechanized living creatures of metal. / Standard monsters of flesh. Nimble and can swiftly dash without limit. / Sprinting is punctuated by resting from time to time so that your stamina gauge doesn't run out. Cliff climbing is smooth. Like semiautomatic acrobatics. / Steadily climb while managing the stamina gauge. Battles are flashy. Bring down the enemy with an overwhelming attack and end with a finishing blow. / Fights tend to become a matter of using long range attacks and attacking after dodging, to minimize risk of damage. Even if you run out of ammo you can quickly craft things on the spot and make as many life restoration items as you want. / Preparation and making arrows, weapons, equipment and cooking beforehand is essential. Take out enemies and become stronger through skills and leveling up. / Become stronger by finding shrines, clearing puzzles, and increasing the level of your stamina and heart gauge. Free to catch as many horses and creatures as you want and switch rides often. / You have to register horses at the stable, and there's a limit to the number of favorites you can have. The graphics are very realistic. The models of the machines and things are beautiful and the attention to detail is eye catching. / Presented with a cartoonish art style that omits details, yet possesses a unique characteristic. Story driven. The intention of the main character is clear and it follows the story. / Freedom. The depiction of the main character is vague and he has no dialogue, so it is easy to project the player's own feelings. Due to the aforementioned point, one doesn't get lost because the next destination is made clear by the basic structure. / It's nice that everything is open and available. You are allowed to go everywhere and even challenge the last boss from the beginning. And his ultimate conclusion might surprise you… considering he works for Nintendo. Overall, Horizon is more stress free and Zelda is becoming a tiresome routine. However, if you've played Zelda, you probably understand this well: the chores of Zelda are the most fun part! Not outright victory to either.